The Onoe Kikugoro family is one of the leading families in the world of Kabuki and many critiques and stories based on personal interviews with the leading actors in this family over the generations have been published hitherto. 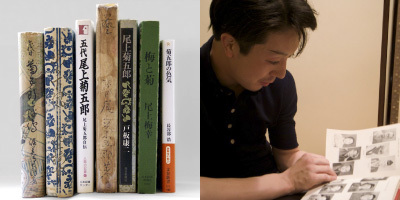 The following section offers a guide to eight of the most important books on the Onoe Kikugoro family. We hope that it will be of use to people for whom this website has sparked an interest in Otowaya. A few of the books referred to here are currently in print, but those that are not should be relatively easily accessible for reading or purchase at leading libraries or second-hand bookstores.